Drain relining is a great method to repair damaged drains without the disruption and cost of digging up the existing drain, provided the damage to the drain is not too extensive. Drain relining is achieved by hydro jetting the drain to clear the root intrusion or obstruction, then video surveying the drain to determine the exact position of the section of drain needing relining. A special inflatable bladder is then inserted into the drain, covered with a special epoxy coated liner and positioned in the drain to cover the damaged section. When the bladder is inflated, the epoxy lined sock expands and compresses against the inner wall of the existing cleaned drain pipe and allowed time to cure and set. Once set, the bladder is deflated and removed leaving the epoxy lined sleeve set in position, relining this previously damaged section of the drain. 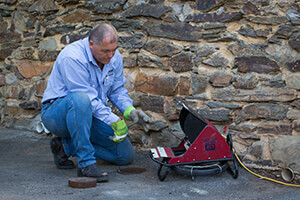 A final video camera inspection ensures the repair is sound and the drain can then go back into service. Call Mott Plumbers and we can determine if your drain problems can be addressed in this manner. If a section or an entire property drain is too badly damaged to reline, as a last resort Mott Plumbing can excavate and replace all or part of the property drains as required. This often involves the use of excavation machinery provided adequate access is available. If access is too tight for mechanical excavation then manual excavation will be the only option. 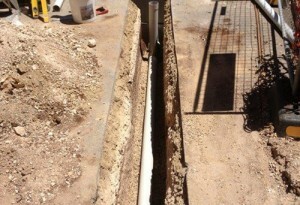 Once the old drain is exposed and removed, the trench is prepared and compacted as required. The new PVC drainage systems are installed to current code requirements and inspected and passed before the drain is backfilled. Excess spoil can also be removed from site. New drains are designed to provide years of good, trouble free operation and you can rely on the Mott Plumbers to do a great job.